Combination clipboard and padfolio. Keep you organized and look professional all the time. If you don't like the clip and prefer a regular pocket on the right size, please find at link: https://www.amazon.com/dp/B0719GTVC7. If you want a business folder padfolio with power bank, please find at link: https://www.amazon.com/dp/B0761R3P7B. 100% money back guarantee: If you are not completely satisfied with our product, let us know, we will give full refund within 3 months, or replacement within one year. 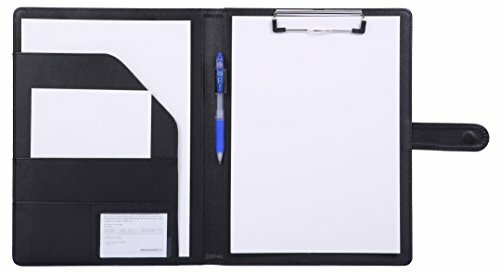 Size 9"×12.5", accommodates A4 letter size loose paper sheets or writing pads (paper and pen are NOT included). Easy to stack, and the strong clip holds paper steady. Made of Premium faux leather, durable, lightweight, can be insert in tablet/laptop case, or large handbag or backpack, making it convenient for daily use. Various inside pockets and slots capable of holding business cards, ID cards, documents, and a pen, which facilitates daily use and business travels. 100% money back guarantee: if not completely satisfied with the item, we will give full refund within 3 months.